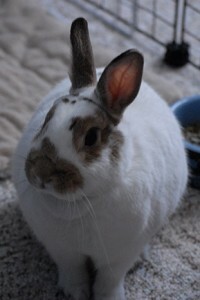 Hi everyone, my name is Houdini and I am a former ESRREC bunny adopted by the founder Cora. In fact, I was born at the Kent County Humane Society shelter and ESRREC transferred me, my sister Abby, and parents Olaf and Anna. 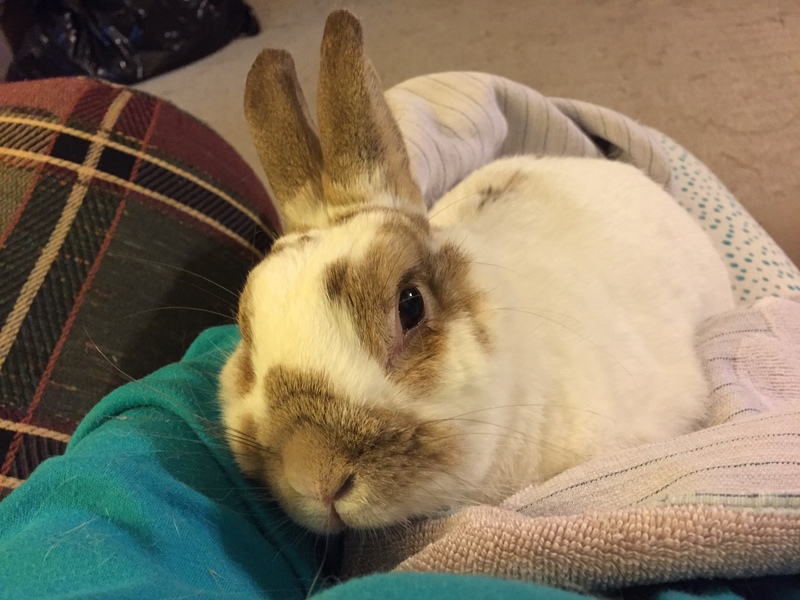 My favorite pastimes are digging at blankets and snuggling with Cora, as well as with my bunwife Domino, also a rescue rabbit from ESRREC. Have you heard about ESRREC’s Hop-A-Thon on August 5th? I’m really looking forward to it. Cora bought me a special H-style harness just for hopping, and she’s going to register me for the class and the “easy” competition. Many of you are aware that rabbit hopping is a sport gaining popularity in Europe. But did you know that bunnies can learn to navigate the hopping course without bribing them with treats? Because it’s just naturally fun! And when we run the courses with our humans, they aren’t leading us, we’re leading them and we can have fun together. Of course, an older or sick rabbit may not be the best candidate for this hobby. 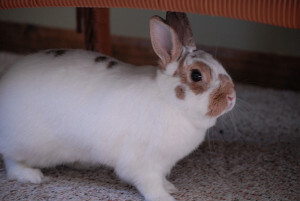 But otherwise, any breed of rabbit – even a mixed breed like me that often end up in the rescues – can do this! A hyper rabbit will get the exercise he/she craves, and a lazy rabbit might surprise you by getting more active with the stimulation.  ESRREC is partnering with Alikatt Rabbit Hopping & Agility, which is based in Pennsylvania, to offer the beginner’s class and demonstrations. It’s a great opportunity for us bunnies to try this new thing. Then we can show off what we’ve learned and maybe win a ribbon or trophy in the competition! Even better, maybe when the general public comes to the Hop-A-Thon and sees us having fun, they will understand what great companion animals we are… and some of my friends still living in the ESRREC shelter will get their forever homes!! Visit our website for more information on how to register your bunny for the hop-a-thon. Hope to see you there! Editor’s note: Usagi passed away in October 2016 from old age. Her protégé Houdini will take over the “Ask Usagi” column. 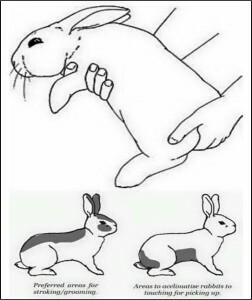 Recently, I’ve been doing research on rabbits so I can try to convince my parents to get me one. The main thing that my parents are concerned about is space. I have found lots of different answers on the size cages need to be, but I don’t know which one is right. How big does the cage need to be and does it depend on the size of the bunny? This is a great question! There are many different ways to approach this. The most important thing from a rabbit’s perspective is to give us a safe place, not to make us feel confined. So yes, it does depend on the size of the bunny and the number of bunnies – for example, if we are a bonded pair we need a larger cage. Being able to move around freely, standing up on our hind legs, and having enough space for our litter box, water bowl, and food bowl plus some toys and a comfy pet bed are all important considerations. The House Rabbit Society has some advice here about housing. Long story short: really, we should not be spending all of our time in the cage. Interaction with the family is important for everyone’s mental health. We also need to be able to get exercise every day. Sitting around in a cage all day will lead to obesity, boredom, etc. 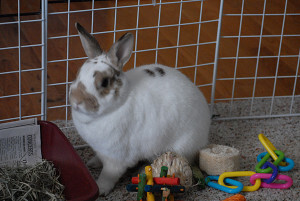 Some rabbit adopters don’t even have cages, they let the rabbit roam the house freely. However, a lot of extra precautions should be taken so that we learn how to use a litter box properly and not chew on things we aren’t supposed to – like cords, or furniture. There are also people who provide a large pen or closed off area so that there is plenty of space to run around and binky. Maybe even enough room for the humans to get inside and spend time with us. Check out some cool ideas here. If you don’t have horizontal space, see if you can make use of vertical space. Some adopters have learned how to create special multi-layer cages from organizer cube components. You can also buy pre-made bunny condos with ramps between the layers. Leith Petwerks is a great example. Although I cannot definitively answer your question, maybe I have given you a little bit of food for thought. Knowing whether you want a small or a large bunny may help guide you towards a solution among the many options. 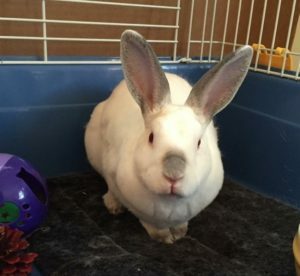 Most of all, I hope that you will consider adopting a rescue rabbit like myself – because we are so very grateful to have a second chance with a loving family! Thank you for taking my question. I am interested in potting some herbs and veggies for my BunBuns (bunny – safe herbs and veggies of course). Please recommend some bunny safe potting soil. Growing fresh herbs and veggies for your bunny is a wonderful idea. Organic potting soil should be perfectly safe. Any potting soil is probably OK if you don’t plan to let the bunny graze directly on the garden or potted plants. Avoid using pesticides and chemicals directly on the plants, of course! By the way, we are looking for volunteers to grow some herbs and veggies for the bunnies at the ESRREC shelter. We have numerous large pots and window boxes that could be used. Thank you for your question and I wish you the best of success with your gardening! Hi, my name is Usagi. That’s Japanese for “rabbit”! 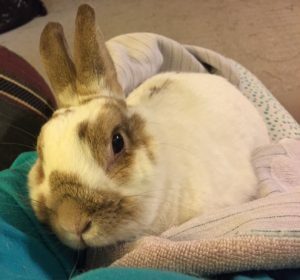 I am here to help if you have any questions about taking care of a house rabbit like me. I’m very excited to help you understand your bunny’s needs so that you can have a happy friendship. Stay tuned for future blog posts with tips & info!